1. Preheat the oven to 200°C, gas mark 6. Toss the asparagus with half the oil and arrange in a single layer in a roasting tin. Cook for 20 minutes turning halfway through until tender and lightly browned. 2. Meanwhile heat the remaining oil in a heavy-based saucepan. Add the shallot and garlic and cook gently for about 3 minutes until softened. Add the rice and stir to coat in the oil. Add the white wine, bring to the boil and simmer over a medium heat until the liquid is absorbed, stirring constantly. Add the stock, a ladleful at a time, stirring between each addition until all the stock is absorbed, before adding more, until the rice is tender, about 20-25 minutes. 3. Cut the asparagus into 2cm lengths and add for the final few minutes of cooking, then remove from the heat stir in the cheese, mint and seasoning. Cover the pan and leave to stand. Meanwhile dry fry the slices of ham in a non-stick frying pan until crispy and browned. 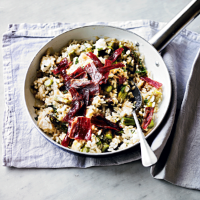 Spoon the risotto into warmed serving bowls and garnish with the pieces of ham.